History is being written in these moments. Every Syrian citizen is taking part in the writing. It started not today, but years ago when the crisis and the war on Syria began." I think that after the liberation of Aleppo we’ll talk about the situation as ... before the liberation of Aleppo and after the liberation of Aleppo." "Until recently, the militants controlled key oil fields and communications channels with Turkey in the Euphrates valley. Aleppo's liberation has undermined the economic base of terrorist groups and the supply routes to Raqqa, the capital of Daesh's caliphate. Now the Syrian Arab Army could focus on two regions, Idlib and Raqqa." If it takes four armies to capture one city, Aleppo, in a period of many months, it's delusional to believe that the rest of the country is going to fall quickly. Al-Assad and Russia's president Vladimir Putin received a taste of what they're in for this week when the so-called Islamic State (IS or ISIS or ISIL or Daesh) recaptured the city of Palmyra from Syrian and Russian forces last weekend. Not only that, but ISIS entered the big Russian-Syrian T-4 air base outside the town, carrying off substantial quantities of Russian armaments including assault rifles, ground-to-ground missiles, anti-tank missiles, and anti-air rockets. Russia's troops, backed by massive airstrikes, had captured Palmyra in March of this year. Putin had declared the recapture a major victory in the war and a major turning point (which is what he's saying now about Aleppo). 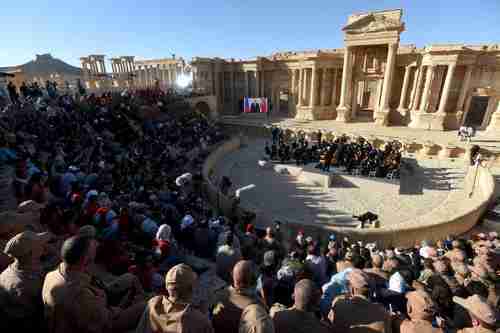 Putin even held a triumphal, widely televised concert in Palmyra's Roman ruins on May 5, with the orchestra conducted by the internationally distinguished maestro Valery Gergiev. So ISIS's success in Palmyra is a major fiasco for Russia and a major humiliation. According to reports, the way it happened is that Palmyra was originally recaptured from ISIS by Russia's special forces (Spetsnaz). Afterwards, the special forces were withdrawn from Palmyra and sent to Aleppo, where they are involved in the war there. According to Igor Konashenkov of the Russian defence ministry, ISIS immediately sent about 5,000 jihadists from Raqqa to Palmyra to achieve its victory. Undoubtedly, once Aleppo is captured, Syria and Russia will turn back to Palmyra and recapture it again from ISIS. But will that leave Aleppo vulnerable? And if it took four armies to capture Aleppo, while losing Palmyra, how can they hope to recapture the entire regions of Syria that are under control of the Free Syrian army, al-Nusra, and ISIS, and keep captured areas under control? In 1953, French forces under the command of Gen. Henri Navarre were fighting Ho Chi Minh's communist forces in Vietnam. Navarre said, "Now we can see [success in Vietnam] clearly, like light at the end of a tunnel." The French forces were decisively defeated at Dien Bien Phu in May 1954. In June 1966 President Lyndon Johnson said "I urge you to remember that Americans often grow impatient when they cannot see light at the end of the tunnel - when policies do not overnight usher in a new order. But politics is not magic. And when some of our fellow citizens despair of the tedium and time necessary to bring change - as, for example, in Vietnam today - they are forgetting our own history." The phrase "light at the end of the tunnel" was repeated frequently in the 1960s in reference to the Vietnam war, both by government officials and by antiwar activists mocking government officials. The Tet Offensive in 1968 turned public opinion negative towards the war, though it did not end until several years later. This week, Bashar al-Assad and Vladimir Putin are talking about a "history in the making" victory. It's not exactly the same phrase as "light at the end of the tunnel," but it has the same flavor. America was in a generational Awakening era. America's previous generational crisis war was World War II, which had ended explosively with the firebombing of Dresden and the nuking of Japan. These acts were so shocking that they ended the war shortly after. America tried to repeat its WW II by bombing strategic targets in North Vietnam, but with little success. The rules of war are different in generational Awakening eras than they are in Crisis eras. Survivors with memories of the last crisis war are not so easily shocked. In fact, America was hampered by its own lack of will to fight, something that almost all historians agree with today. Whereas America could use a nuclear weapon to end WW II, domestic and international political pressure forced America to use bombs carefully and sparingly, to prevent civilian casualties, and to take various humanitarian breaks, especially at Christmas. Syria is in a generational Awakening era. Syria's previous generational crisis war was the Syrian civil war that climaxed in February 1982 with the destruction, by Bashar's father Hafez al-Assad, of the town of Hama. There had been a massive uprising of the 400,000 mostly Sunni citizens of Hama against Syria's president Hafez al-Assad. He turned the town to rubble and killing or displacing hundreds of thousands. Hama stands as a defining moment in the Middle East. It is regarded as perhaps the single deadliest act by any Arab government against its own people in the modern Middle East. It was a shocking act that ended the war. Al-Assad is trying to repeat his father's 1982 success by repeating in Aleppo the same acts that his father committed in Hama. But the rules of war are different in generational Awakening eras than they are in Crisis eras. Nobody is shocked by what al-Assad is doing, only sickened and disgusted. In fact, Syria and Russia are hampered by enormous international pressure to protect civilians and provide humanitarian aid. Just as America could have won the Vietnam war by dropping a nuclear bomb on Hanoi, al-Assad and Putin could probably win the war in Syria by dropping nuclear weapons on Aleppo, Idlib and Raqqa, but they're being held back by international pressure to prevent civilian casualties and to provide humanitarian aid.